You’re here because you’ve decided that you need to filter your drinking water and want to select a pitcher type water filter that best suits your needs. If you’ve narrowed your choices down to the Brita vs Pur vs Zero Water filter pitchers and want to know which of these to choose, you’ve come to the right place. Although there are now many more options in the market, these big 3 brands are extremely popular, not least because you can find their filter replacements almost anywhere. This is important because there’s no point in filtering water if the filter has run out of its filtration power. Finding the right brand replacements easily is important so that you’ll always have clean and safe water to drink. It’s not necessary to stick to these three brands if others use filters that are easy to find. In fact, you may find a few other pitcher water filters that could work just as well for you. Want to see which worthy competitors made our list of best water filter pitchers? There is no way to tell you if Brita, Pur or Zero Water makes the best water filter pitcher. That’s because each has its own strengths and weaknesses. The best thing to do is to tell you where each one excels and where they fall short. After that, it is up to you to decide which criteria are the most important to you and choosing one becomes easier with that knowledge. 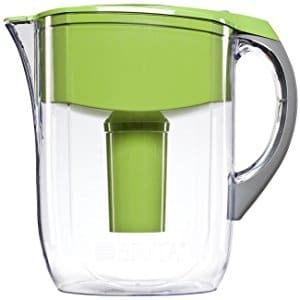 Brita Large 10 Cup Grand Water Pitcher in White, black, stylized black, green, orange, red and purple, and the Brita 10 Cup Everyday Pitcher. PUR 11 Cup Ultimate Pitcher and the Pur 11 Cup Classic Pitcher. Assuming you have narrowed down your choices to these 3 brands, how do you choose from them to suit your needs best? The following criteria are the ones you should look at to make the choice. We list and explain each of them and tell you how each of the three brands rank for them. This is possibly the most important factor to consider. Impurities of different types – inorganics, metals, pesticides and VOCs(Volatile Organic Compounds). Water filters cannot remove bacteria. Not all filters are created equal and some do a better job of removing the most impurities. Even if a filter is certified to remove a specific impurity, it may not be at 100%. While it’s perfectly fine to have a small amount of certain minerals like Calcium and Zinc in your water, you don’t really want any amount of lead or mercury in there. So pay attention to which impurities are removed and the percentage of removal of each specified for the filters. The NSF tests and evaluates various water filters to certify them if they meet certain set standards for removal and reduction of impurities. Any filter that does not use reverse osmosis will be certified 53 if certain impurities, including lead, are reduced. Some certified filters may go above and beyond the minimum standard. If your number one criteria in picking a water filter is having the absolute cleanest water, then the choice is very easy, because Zero Water wins hands down and you can go ahead and choose whichever pitcher that meets your capacity needs. Its filter reduces all TDS (Total Dissolved Solids) to almost zero with its 5 stage filtration process. In particular, the level of Lead and Chromium removal is the maximum here, although most municipalities handle removal of lead anyway. But if that’s not enough for you and you don’t want to risk a Flint, Michigan type problem, then you should choose a filter that also removes lead. Not only does the Zero Water pitcher ZP-010 come with the best filter, it also comes with its own TDS meter so you can see the water purity for yourself. If you’ll be happy with the next best filtration performance, the PUR is a good choice. The MAXION filter technology used is a two stage process using carbon activation and ion exchange to reduce Mercury by 96% and certain pesticides by 92%. It also reduces chlorine content. This PUR Ultimate model also includes a lead filter that is certified to reduce it by 99%. The PUR Classic model does not come with lead reduction. However, once the filter in the Ultimate model needs to be replaced, you can choose whichever PUR filter you want, as both are compatible. The Brita standard filter that comes with the Brita Grand Pitcher removes Zinc, Chlorine, Cadmium, Copper, and Mercury but not Lead. That’s fine if you’re sure that your tap water is free of lead. If you want to be extra careful you can instead buy their new Brita Longlast Filters, which reduce Lead, Cadmium, Asbestos and Benzeneas well as the previously mentioned ones. However, while lead is reduced by 99% and it does a very good job reducing chlorine, removal of most of the rest of the contaminants don’t reach as high as Zero Water and Pur filters. These Brita filters are compatible with the Classic and Grand pitchers. Most users love the taste of the water from Brita filters because they do a great job of reducing chlorine. The Pur filters are next best for taste. Some users prefer taste from these two filters to bottled water because there is still a trace of certain minerals left. The Zero Water filter removes all impurities, so while some users say that they love such a pure taste, others may feel like the water tastes flat. All these filters are available on Amazon. Get the Brita Longlast replacement filter, the PUR Ultimate replacement filters, or the ZeroWater replacement filters. Every filter comes with a lifespan rating based on the volume of water that it has to filter. If you have a large family, you will need to replace the filter quite often. Other than that, the lifespan can depend a lot on the quality of tap water you have too. The harder the water, the shorter the lifespan because more impurities have to be trapped each time you pour water in. The Brita Standard filter is rated to last about 2 months or 40 gallons for the average household. That’s about 600 8-ounce glasses. The Longlast filters last for about 120 gallons. The Pur Ultimate filter last for 30 gallons or 480 8-oz cups per filter, while the Classic filter lasts for 40 gallons but a few customers say that it clogs up very quickly. Both these brands assume that all water is the same in terms of impurities so the filter change indicator will tell you when to change once you’ve reached a certain amount of reservoir fills or pitcher pours. The indicator basically measures how much water by volume has been filtered but does not take varying levels of TDS into account. On the other hand, the ZeroWater 10 Cup Pitcher filter comes with its own TDS meter so you can actually verify for yourself that the filter is doing a good job. Completely clean filtered water from Zero Water filters should measure at a 000 reading on the meter. The way you know when to change the filter is when the meter reading reaches 006. Depending on your area and quality of tap water, it can be 1 week or it can be 6 months. This can make filter usage expensive, but if you switch to one of the other brands and replace filters after the recommended intervals, the filtered water you get will likely be lower in purity. Again the choice would come down to cost and whether the level of filtration matters most to you. If you live in a region like Oregon, you’ll probably be using the same Zero Water filter for close to 6 months, so the cost would be less than if you use one of the other filters and replace as often as recommended. Like mentioned above, the Zero Water pitcher comes with a TDS meter. This is a hand held device with a replaceable battery that you dip into clean or dirty water to measure the amount of dissolved solids in it. You have to remember to test your filtered water now and then, but the meter gives you an accurate reading to tell you if it’s time to change the filter. The PUR pitchers are fitted with an LED indicator that lights up green when the filter is still good, yellow when it’s getting close to replacement time, and red when it’s time to replace. The monitor works by keeping track of the volume you pour each time. The light seems to work better on the Classic model than on the Ultimate model, but if it does stop working, it may have gone into sleep mode. You have to press and hold the button to reset it. The indicator battery is not replaceable but the filter will still work. As long as the light does work, make note of how long a filter lasts. Once the battery dies, you can just replace the filter after the same duration. If you like the convenience of the indicator, you can buy a replacement lid separately. The Brita indicator also flashes green, yellow and red. On the Grand model, it counts the number of times you pour filtered water out, but the Everyday 10 cup model counts the number of times you fill the reservoir and close it, and assumes that you fill it full each time. Even if you use the Longlast filters, the monitor knows which one it is and will let you know accordingly. The battery is not replaceable on either model but the filtration will still work if you keep a track of how long the last filters lasted. The amount of time it takes to filter a full pitcher of water depends on its capacity and type of filter. If filtration slows after sometime and it is not yet time to replace the filter, it may just be that there’s an air pocket caused by accumulation of filtered solids. In this case, the filter should be removed, knocked against a counter, shaken and held upside down for a few seconds before fixing it back in to see if it gets faster. Considering the Brita 10 cup Grand or Everyday pitchers, it should take no longer than 10 minutes to filter to full capacity, although it typically takes 3-5 minutes. The PUR 11 cup Ultimate and Classic pitchers are a bit slower to fill, particularly as it the filter gets older. If it takes long even with a new filter then it’s probably because your tap water is quite hard. Comparatively, the Zero Water 10 cup pitcher is very slow because it uses 5 stage filtration instead of 2. It can take about 30 minutes for the full pitcher to filter. However, this is the only pitcher that doesn’t make you wait to get a glass of water. In addition to letting you pour from it like with the other ones, there’s also a spigot at the back through which you can fill a glass or bottle. However, when the water level in the pitcher is low, the flow rate out of the spigot will also slow, in which case it is better to just lift and pour. It is not meant for heavy use as it is rather flimsy. Most users that are not that discerning about filtration quality will point to the pitcher’s design when rating it. All these pitchers are designed to be stored in a full-size refrigerator door. All these featured models are heavy when full. The Pur pitchers are heavy but have a very good handle grip, so there are no complaints of it being too much to lift. The Zero Water pitcher is the same, but for those who can’t pour when it’s completely full there’s the spigot near the bottom to fill a cup. However, this should only be used occasionally because it is a bit flimsy and can break. The Brita 10 cup pitchers can be too heavy for some users to lift with one hand so they should consider getting a smaller model. The handle of the Brita Grand is rubberized and easy to grip but the handle of the Everyday pitcher comes with reports of a design flaw, as the bottom of the handle leaks if you fill it past a certain point. Leaks and spillages while pouring is a common complaint. It’s important to note that you should always wait until filtration is completely done before you pour out a glass, otherwise the unfiltered water from the top can spill out or mix with the filtered water in the bottom. You should also pour slowly, otherwise water can seep out around the edges of the spout, especially if the spout features a flip cover to prevent dust getting in or odors from your refrigerator from being absorbed. The lid is less likely to fall off too. Some pitchers require you to hold it down when pouring. The Brita pitchers are better at not spilling water. The Grand model features a snug lid that should not fall off when pouring. If it feels loose, it is likely not fitted properly or is faulty. To refill, there’s a smaller partially hinged lid that pops up when you press the button. However, this lid does have a tendency to fall off when pouring. You can also remove the lid when pouring out. A flip top cover for the spout prevents dust and bad odors from getting in. While some customers complain that it leaks, others say that it only leaks if the reservoir on top hasn’t completely drained before pouring. You should also not overfill, as that also causes leaks. The newer units of the Brita Everyday model feature a different lid design, which is looser than the old snug lid. Many customers complain that it is too loose and that you need to hold the lid while pouring. It is also a one piece type lid, which means you have to remove it in order to fill the reservoir. The PUR pitchers’ most common complaint is that they leak all over the place when pouring, especially when full. The spout design is flawed so you have to pour at a very precise angle in order to keep things spill-free. There is an easy-fill lid opening for filling the reservoir. The Zero Water has a separate lid that detaches from the main lid to fill the reservoir. This is a bit tough to open everytime you need to fill it. Otherwise, it won’t leak while pouring as long as you don’t do it too fast. There are some reports of leakage around the gasket of the filter but that is fixed by wetting the gasket first to get a proper seal and then screwing on the filter tightly. Some filters need to be prepped before they can be used to give you clean water. This means it has to be done everytime you replace a filter. The new advanced Brita filters do not need to be pre-soaked. Just flush it with cold water for 15 seconds and you’re ready to go. The PUR filters do need to be soaked first for 15 minutes and flushed with running water for 10 seconds before it can be inserted into the pitcher. The Zero water filters don’t need to be soaked but it is a good idea to flush before use. All the pitchers including one filter retail for about $25-$35, but the real cost depends on the cost of replacement filters and how often you replace them. The Brita Longlast filters are double the cost of a Standard filter, but they last thrice as long. The Longlast filters are also very good if you want to reduce a good number of impurities. Therefore, if you choose to buy a Brita Water filter pitcher, we recommend that you switch to a Longlast filter after the first Standard filter is used up. The Pur Ultimate Filter costs about the same as a Brita Longlast and is much less expensive and lasts longer than the older Pur Classic filter, which clogs up quickly. The Ultimate needs more frequent replacement than the Longlast, however. ZeroWater filters are the most expensive of the bunch simply because they’re the best and most extensive. How frequently you’ll need to replace it depends on how good your area’s tap water is. If your tap water is pretty good, a Zero Water filter will last for months, while bag water will force you to change within weeks. Therefore, this filter can place it at the top of the heap for overall cost or it can give you the most bang for your buck. Now that we’ve explained how each brand measures up for various features and criteria, let’s do a quick recap of the pros and cons of each. We’re going to focus on the newer models of the Brita and Pur, i.e. the Grand and the Ultimate respectively. Does a great job filtering for chlorine. The Longlast filter reduces lead and other impurities too. Level of reduction of most impurities is not the best. Easy fill lid has a tendency to fall off. Good at filtering out chlorine and pretty good at filtering out other impurities, including lead. Takes a long time to filter. Easy to spill when pouring. Best filtration with almost total reduction in harmful TDS. Comes with a TDS meter for accurate water quality measurement and knowing when to replace the filter. No need to wait for filtering to complete to get a glass of water. Since most places in the USA have pretty decent quality tap water, people in those places will spend less on filters. Filter costs can be high if you the tap water is very hard.